Joined by the Cat Writers’ Association Annual Conference! Beware of hotel phishing scams! Do not ever provide any information via phone or email or form to anyone about your travel to/from the BlogPaws conference. We do not work with any companies–only Rebecca! 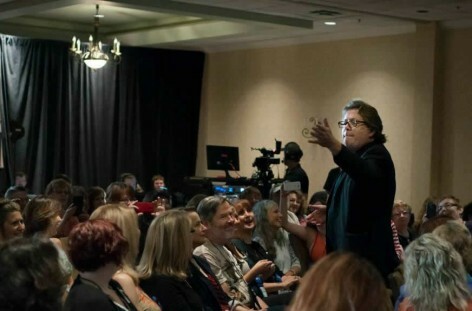 We’re a 3-day conference jam-packed with educational sessions led by leading professionals, networking with influencers, a busy exhibit hall, exciting brand events, more influencers, and lots of pets. 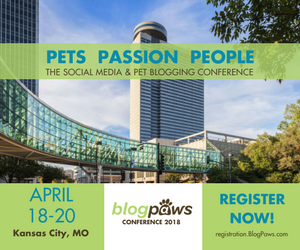 Pets remain at the heart of everything BlogPaws does. Our pet friendly conferences invite all pets, everywhere in the event space. In the world of pets, we began the conversation in 2010, and we have dominated it ever since. Today, we are the conversation. Last year, the chatter on social at the 2015 conference reached 75.9 million people with 3.7 million engaged. For our 2016 event we expect to attract more than 400 influencers and more than 100 brands, and we will sell out! We welcome your questions and comments. Join us for the 8th BlogPaws Social Media and Pet Blogging conference in Phoenix, AZ June 23-25th. 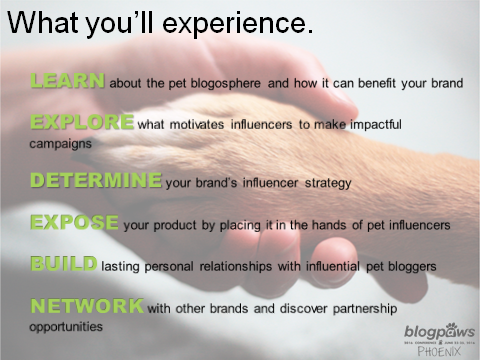 Brand interested in sponsoring email chloe @ blogpaws.com for more information. We’re excited to see that so many attendees have already registered! Not registered yet? You can use the form below right now…go for it! Video by Robert Semrow and the Pet World Insider crew.